Scanned with my own scanner from a pencilboard. All hail Kiba.. because he's good looking without a shirt. Proposed by Saikusa and highlighted by Marissa. 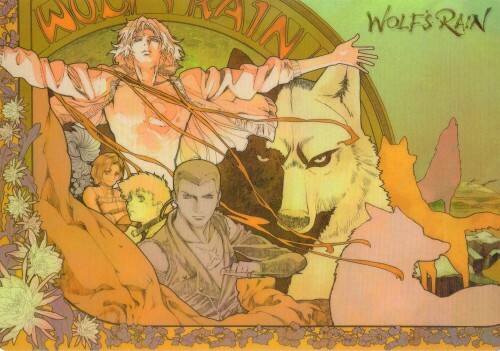 Browse Wolf's Rain Gallery: Recent | Popular. Again this is stunning, I can not begin to express how wonderful these are! Thank you so much for sharing this, it's art nouveau air is incredible. Art nouveau, my favorite artwork based the the most amazing anime I've seen! Thanks so much for sharing this scan! I was looking for this particular scan everywhere, and I finally found one that's perfect and is at a high resolution! You're my hero. Awsome wallpaper. Love wolfs rain. Thank You very much for this scan. I can't believe I've never seen this scan before.